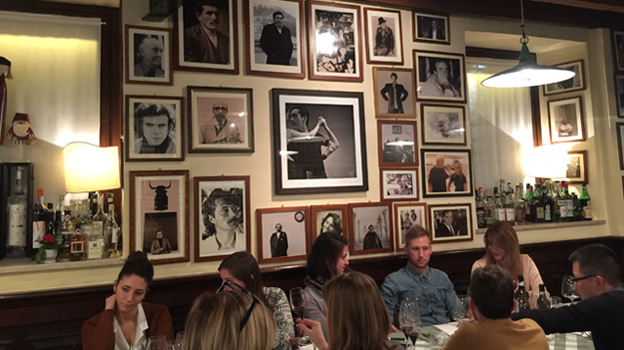 Readers spending time in Verona and looking for a hearty meal with well-cooked dishes and a fairly priced wine list especially rich in local wines of the Veneto (with some older vintages going back to 1995), would do well to check out Trattoria Al Pompiere. Super popular, Al Pompiere is always packed. 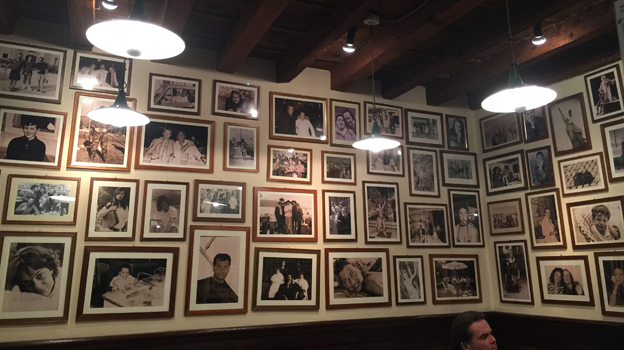 Italians and foreigners alike fill the tightly spaced tables in two rooms decorated with exposed wooden beams, old photos of past and current patrons and host of other rustic charms. One caveat - the noteworthy din made up of happy chatter and laughs does not make for an especially romantic evening. 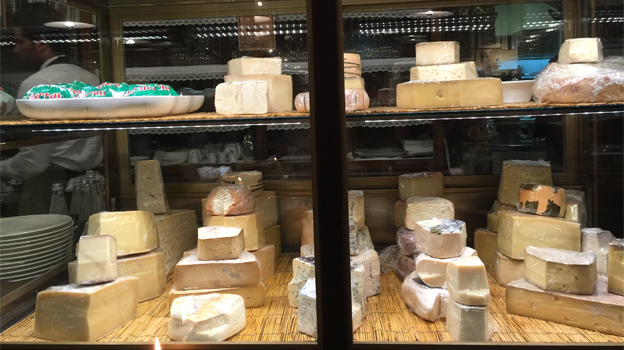 The eye gazes over the cheese corner, where about 100 different Italian cheeses are in full view, before moving to the charcuterie corner, which is a filled with about 40 different salumi. 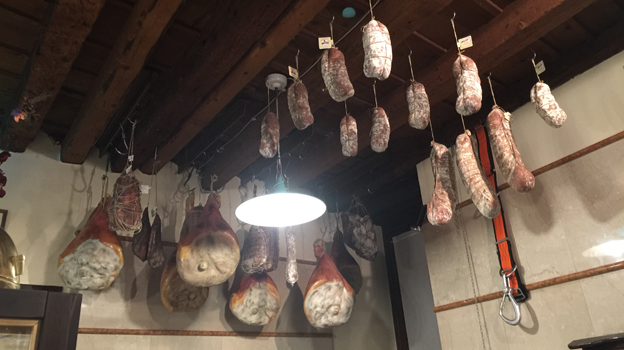 As if that weren’t enough, prosciuttos and salamis hang from the rafters in true postcard style. The trattoria was founded in the first half of the last century by a retired firefighter who refused to give his restaurant a name, and so it became known simply as Al Pompiere (pompiere in Italian means firefighter). On this night, I invited roughly fifteen people I work with. In addition to having an all-round good time, our group made short work of our dishes and wines. Il Pompiere is a haven for traditionally cooked fare, such as bigoli with sardines and oven-baked shank of pork with mashed potatoes. We opt for an antipasto of delicious salumi, then move on to our primi with very good tagliolini with mushroom, followed by one of the best renditions I have ever had of risotto all’Amarone (truly one of the best dishes I have tasted this year). 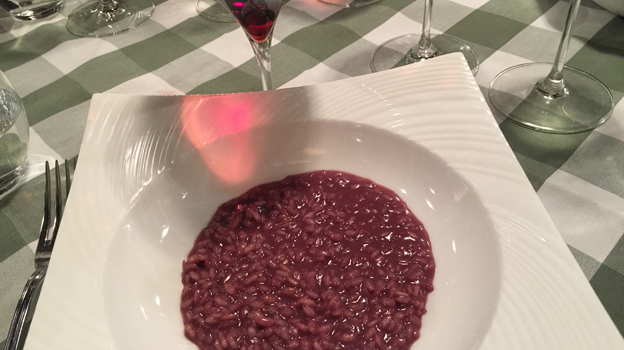 I can’t vouch Al Pompiere gets the risotto this right every time, but I would certainly be willing to go back and try again just to see if perfection can strike twice. Unfortunately, the beef is tough, full of nerves and not especially savory. It is a rare misstep for Al Pompiere, where I can’t recall ever having had a bad dish. I guess everybody’s allowed one mistake. Hopefully it won’t happen again. The wines are just fine, with one truly memorable bottle in the mix. The NV Sacramundi Durello Brut Ventus, from an up and coming producer in the Lessini Durello production area, shows how delicious wines made with the Durella grape can be. Bright and crisp, its high but balanced acidity lifts the zingy green apple and floral flavors and nicely prepares the stomach for the food to come. It makes for a simply delicious aperitif that, though not the last word in complexity, is precise and well made, not unlike a higher acid, more austere Prosecco with greater bite. The 2004 Ferrari Giulio Ferrari Riserva del Fondatore is another fine vintage for this venerable name in Italian sparkling wine. Perhaps not quite as rich and deep as some other vintages of Giulio Ferrari I recall, but more immediate and fruity in its upfront charm, it is a simply splendid partner to the charcuterie plate. The 2013 Herri Mina Irouleguy Blanc is by far the best wine of the night. Actually, it turns out to be one of the best whites I have ever tasted from this producer, whose wines I have been tasting regularly for the past fifteen years or so. Made in the little known Irouleguy appellation of the French Basque country, it’s a blend of Gros Manseng, Petit Manseng and Petit Corbou, that offers multilayered honeyed yet fresh aromas and flavors of ripe citrus fruit, delicate botanical herbs and bright finishing lemony zing in spades. A telltale sign of the wine’s success is how many times people at the table picked up the bottle to look over the label in trying to glean more info about the wine. This is an absolutely marvelous light white wine. The estate is owned by Jean-Claude Berrouet, who for more than forty years was the technical director at Pétrus and the various châteaux in the J.P.Moueix stable. 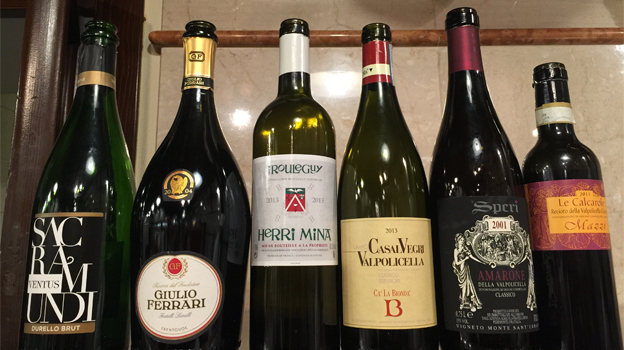 We finish with three Veneto classics: the 2012 Ca’ la Bionda Valpolicella Classico Superiore, the 2001 Speri Amarone della Valpolicella Classica, and the 2011 Mazzi Recioto della Valpolicella, all of which are very true to type and remarkably good examples of what each one of those wines (Valpolicella, Amarone and Recioto) should always deliver but often don’t. The Valpolicella is as it should be, easygoing, fresh and eminently drinkable (and neither needlessly oaky and structured nor super-ripe), the Amarone is rich and well balanced (and not the overly alcoholic candied chocolaty fruit bomb that too many Amarones are nowadays) while the Recioto is perfumed and sweet, but offers a nice light touch.